Pair zesty lamb burgers with crispy sweet potato fries for a creative new take on the classic burger and fries combination. In large bowl, combine ground lamb, tomato sauce, oats, onion, basil, garlic powder, seasoned salt and pepper. Mix until all ingredients are blended. 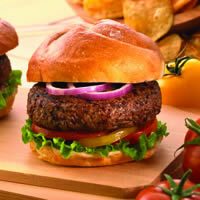 Shape into eight 1/2-inch thick patties. To GrillCook over medium-hot coals. Grill 4 inches from coals 5 minutes on each side or until desired degree of doneness: 145° F for medium-rare, 160 ° F for medium or 170° F for well. To BroilPlace lamb patties on broiler pan. Broil lamb 4 inches from source of heat for 5 minutes on each side or until desired degree of doneness: 145° F for medium-rare, 160° F for medium or 170° F for well. To ServeArrange lettuce leaf on bottom half of each bun. Top with onion rings, 2 tomato slices, cooked lamb patties and bun top.